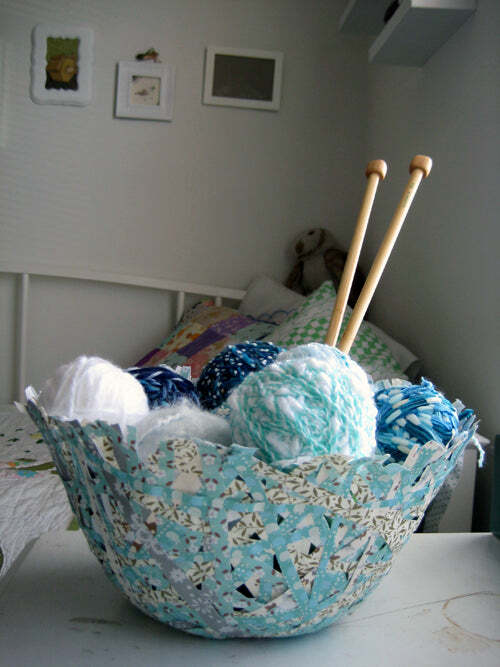 I was organizing this week and needed a place to put my balls of yarn- forget the skeins yarn come in, I love a ball of yarn so I always redo mine into a ball. They look so pretty in a basket or bowl! The problem is mine were in an ugly plastic container in the closet. So when I saw the instructions for a shredded paper bowl in the BH&G Do It Yourself Magazine (Winter 2009) I thought, perfect! You cover a bowl in saran wrap to use as a mold and glue the shredded paper to it in several layers. The instructions call for short shreds and a lot more layering, but I didn't need my bowl to be that sturdy so I used 12" strips. I used scrapbooking paper, it's thick and nice since some of it is double sided! I love the way it turned out. I also did another craft from Do It Yourself magazine which was "curtains" for a table in my art room, so now I don't have to look at all the junk underneath it and I can admire a cute piece of fabric instead. The magazine had a lot of other cute ideas too, I was impressed!